At UKFast we are always looking for new ways to get creative in the classroom and find new ways to tackle that pesky digital skills gap we always read so much about! Well, this time we’ve decided to take our efforts to those heroic types who have the biggest opportunity to influence the next generation of digital whizzkids – the teachers! Tim has the lowdown. The idea behind our latest series of Linux workshops is to close the gap between the IT that youngsters are taught in school and college and the skills that are needed by businesses in the tech industry. We’ll aim to combat the shortage of skilled people and add value to the students as they gain the talent that will land them a cool job in the fastest growing industry in town. The workshops are being run with the support of our partners at the Linux Professional Institute (LPI) and, you guessed it, are heavily focused on the Linux operating system. The plan is to give teachers the tools and quals to pass on Linux learning to their disciples. Linux is a particularly popular OS in the hosting industry where it is used in more than a third of global hosted applications, so if you’ve got the skills you can pay the bills. 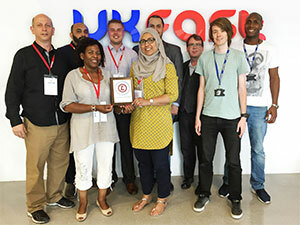 This isn’t the first time that UKFast has stepped up to try and give digital education in the UK a boost. We work with 35,000 students across 45 schools in Greater Manchester, looking to inspire and educate the next generation about what an incredible career in tech can look like. Our CEO Lawrence believes that the skills gap in the digital sector is something “both schools and businesses have a responsibility to address”. So that’s what we’re doing! Bill Quinn, the man who represents the LPI in the UK and Ireland, attended the event last month, and said: “There is a large amount of evidence to support a critical job shortage in the IT sector, in particular for people with Linux and open source skills. At the same time, there are a number of organisations talking about the problem but not offering a solution. Thanks Bill; great to hear that we’re on track but there’s still loads of work to do, so watch this space! Take a look at our training and education page for more information on the work we do. Linux Training Hits the Next Level!